Check out this nice 2004 Chevrolet Silverado 2500HD 4x4! This truck looks and drives great! It's loaded with great features including 6.0L V8, 4x4, Tow Package, Bed Liner, Power Driver Seat, Power Windows, Steering Wheel Controls, Locks, Mirrors, Tilt, Cruise, A/C, CD, and much more! It's priced to sell ASAP so call 402.991.1112 now! Get Pre-Approved now on our website http://TheInternetCarLot.com or call us at 402.991.1112! 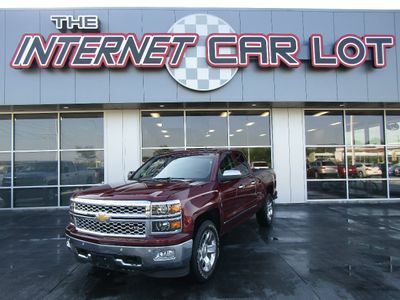 The Internet Car Lot, Inc. is a Nebraska Licensed dealership located in Omaha, NE which helps private parties market and sell their vehicles worldwide using the power of the internet. We provide a safe and secure solution for buyers and sellers to purchase and sell vehicles with a reputable "brick and mortar" business. Not only do our buyers experience private party prices, they also receive all of the benefits of purchasing from a dealership including in-transits. We also maintain a small inventory of affordable cars that we sell directly to you with very minimal margins to keep our prices incredibly low! Our small overhead, low margins, and volume helps you get an affordable car at amazing prices! Contact us for our full affordable inventory today! NEED SHIPPING? WE WORK WITH OVER 3,000 SHIPPERS! We are happy to arrange shipping destination at competitive and reasonable rates. We work directly with over 3,000 dependable shipping companies to help you find an unbeatable price! All shippers are licensed, bonded, insured, and offer fast and secure delivery. Please call us at 402-991-1112 for a shipping quote delivered directly to your door! Yes we offer financing. Please fill out a secure finance application here to get the process started or contact us at 402- 991-1112. Yes we do! Please contact us with your detailed vehicle information for a quick trade quote back! NEED TO SELL YOUR VEHICLE? LET US DO ALL OF THE WORK! APPLY ONLINE NOW with our SECURE CREDIT APPLICATION here! Already Have Vehicle Financing Secured? In most cases, The Internet Car Lot can MATCH or BEAT our current financing rate giving you the added convenience of one stop shopping for your automotive needs. The Internet Car Lot works with over 25 lenders to ensure you get the best possible interest and term for your loan! We'll work hard to get you the best possible payment! Contact us today at 402-991-1112 for more information, or fill out our Online Credit Application to begin the pre-approval process today. We offer very affordable extended warranty protection including FACTORY TYPE COVERAGE, 100,000 MILE/8 YEAR coverage, FREE Roadside Assistance, and much more! If you are interested in purchasing an extended warranty protection for this vehicle, please call us at 402-991-1112 for more information! WE WORK WITH OVER 3,000 SHIPPERS! We are happy to arrange shipping destination at competitive and reasonable rates. We work directly with over 3,000 dependable shipping companies to help you find an unbeatable price! All shippers are licensed, bonded, insured, and offer fast and secure delivery. Please call us at 402-991-1112 for a shipping quote delivered directly to your door! Monday: 9:00 a.m. - 5 p.m.
Tuesday: 9:00 a.m. - 6 p.m..
Wednesday: 9:00 a.m. - 6 p.m..
Thursday: 9:00 a.m. - 6 p.m..
Friday: 9:00 a.m. - 6 p.m..
Saturday: 9:00 a.m. - 5 p.m.